Send a Bob Ward's Gift Card by email or physical mail. Redeem it online and in-store. No expiration, fees, or minimums. Buy and send a physical or digital Gift Card. Send a Bob Ward&apos;s Gift Card by email or physical mail. Redeem it online and in-store. No expiration, fees, or minimums. I ordered a gift card on your website. It was very easy to do and I received the card quickly. Just a fun fyi - my husband brought my wedding ring from your store in Missoula 53 years ago. still wearing it. Giftcard is great way to go! We ordered giftcards to give to our college kids in Bozeman and they loved them. Its a great way to go if you live out of the area....or even in the area. The cards were received in the mail without a hitch. You began your request for my review with Dear Russ H. by the name of the person to whom I wanted to send the gift card. I never received an acknowledgement that the gift card was sent. Leaving your customers in the dark is not a good way to garner positive reviews. Can't believe Bob Ward's treats gift card senders this way. While this was an online purchase, it was nevertheless a great experience, and very simple. I will doubtless use this experience as a bell-weather for future purchases, both online and in person! I ordered a gift card on 25 May for a birthday on 1 June. Plenty of time to be received, right? Wrong. It was finally received on 17 June. And lest you think it had to travel a great distance, it did not. The recipient is in Montana. Far too long for good customer service. My son LOVES your store and asked for a gift certificate to it for Christmas. It is an easy gift to purchase because this is just what he wanted. Thank you for being so prompt in sending the gift certificate! We ordered a gift card . The card was sent to us in Nevada in a quick and timely manner. It was very easy to navigate the site. From locating the item to payment. It was a nice, easy transaction. I purchased a gift card for my son-in-law and being from out of state I was a little concerned. But my purchase was mailed to the recipient in a timing manner and was exactly what I ordered. Everything was as it should be and it was delivered to the correct person and on time. I greatly appreciate your attention to my order and fulfilling my request. 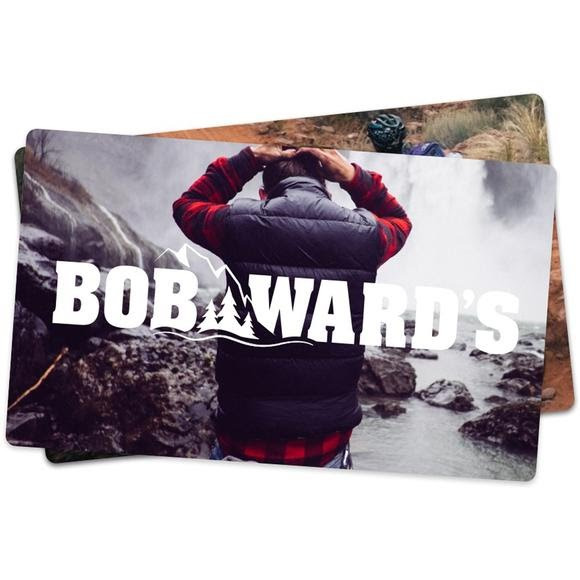 Ordering a gift card from Bob Ward's was so easy and the perfect gift. It arrived just days after I ordered it. So easy for me and so much fun for my son to pick out what he wants! Cards were easy to order and arrived promptly. Our grandson called on Christmas morning to "thank" us for the gift card we had sent to him from your store. He told us that he was so happy to get it, and that he thought that he would buy an air filtration system for when he goes hiking. I had forwarded one of your emails to him so he could fill it out and let you know how he felt about receiving it. The order went very smoothly and gift card arrived quickly! Would definitely recommend and would purchase again!